Lifters usually take one of two approaches to calves: go HAM with weight or volume, or skip it entirely. Here's a simple yet sinister protocol that is perfect for adding size, and can even improve your squat! The calves are one of the most notoriously stubborn body parts to build. That much is no secret! There are plenty of strong and jacked lifters who look like chicken-legged pretenders in a pair of gym shorts (as commenters love to point out). As someone who did not hit the genetic lottery of natural lower-leg development, bringing up this region of the body has been a performance and aesthetic focus of mine for as long as I can remember. But I've also learned a few important things along the way. For one, most people should definitely train calves hard at least twice a week, even if you don't see much payoff from it in terms of size. The calves are powerful muscles that factor into everything you do in the gym and outside of it, and not training them isn't the answer. But there's another big reason. Training calves is also, in my experience, the best way to build that quality that everybody blames for their terrible squat and lunge form: ankle mobility. Best of all, calf training can be done very simply—not to be confused with "easily." 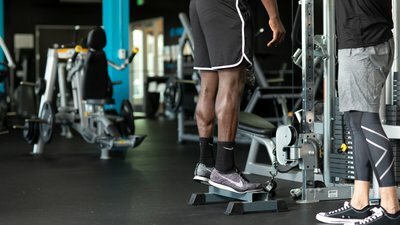 I guided Bodybuilding.com athlete and NPC men's physique competitor Reuben Brooks through my favorite protocol, the calf raise "death set," in the Bodybuilding.com All Access release Unstoppable: The Ultimate Guide to Training Through Injury. Ready? It's time to get to work and light a fire in those lower legs. Start off with a few ramp-up sets of 10-12 reps to reach a top weight that's 10-20 percent of your back squat one-rep max. This may not be exact, but if you can get somewhere around 25 reps on your first set, you're in the ballpark. Yes, that is extremely light, but before you load up and go too heavy, try it my way first. With the load placed around your waist with a dip belt, or positioned on the shoulders in a Smith machine, elevate your toes up on a step, box, or calf raise bar to increase the usable range of motion for this exercise. Once the load is set, position your feet at hip width, with your toes pointing slightly out. Now you're ready. And your goal is to accumulate 100 perfect reps in as short a time as possible, using as many rest-pauses as needed along the way. So, say you get 25 reps on your first set, and can't get another quality rep. Step off, place both of your feet on level ground, and breathe deeply for 10 seconds. Then, step back up and hit failure again. Continue to "rest" 10 seconds after hitting failure until all 100 reps are completed. Sure, this looks like no big deal on paper, but if you tap into your mind-muscle connection on each rep, flexing as hard as you can while pausing for a split second at the bottom of each rep, these reps will add up quickly and create one of the nastiest pumps of your life, and in record time. The lower legs are considered "posture dependent" muscles, which means they are pretty constantly firing to keep us standing, and to maintain balance and function throughout the day. In a perfect world where everyone's posture is pristine from head to toe, this also means the calf muscles of the soleus and gastrocnemius would be the only muscles that need to stay active in order to keep up in a standing position. So yeah, they're stronger than you think! While the anatomy textbook will tell you that the gastrocnemius and soleus have primary actions of plantar flexing the ankle dynamically in activities such as running, jumping, and walking up stairs, it fails to mention that these muscles are stabilizers first, and dynamic movers second. In action, this means that since the lower legs are pounded with the daily stress of walking, standing, and other activities, they usually respond better to higher training volumes, lower-end loads, and more stressful metabolic environments. I'm not a huge believer in just doing bodyweight calf raises every day and hoping and praying they work. But I'm equally suspect of training methods that place these tiny intrinsic muscles under monstrous loads. All that usually ends up achieving is compensation from other muscle groups, and not targeting the actual calf muscles. By appreciating the power of load—but keeping it light enough to keep quality of movements high—the death set simple achieves the best of both worlds. We can tap into the power of metabolic stress, while creating a pump that will leave your lower legs smoked. Focus in on using this method 2-3 times per week, ensuring full recovery between sessions, and say hello to some nice calf gains in a few weeks. If you think training the lower legs directly is just about vanity, think again. Strategically taking the ankles through a full range of motion can do just as much, if not more, for your ankle mobility as it can for lower-leg hypertrophy. When we break down the functional anatomy of the lower leg, there are three main drivers of plantarflexion (aka, standing on your tippy-toes). Unless your goal is to work on your cankles, the gastrocs—which have both medial and lateral heads—are the calf muscles that are of greatest concern for direct training. The gastrocs are considered dual joint muscles, meaning they cross both the ankles and knees. This is a pivotal detail that many lifters miss out on when training the lower legs, leaving them frustrated with results and blaming their parents for their poor genetic makeup. Here's why it matters: In order to fully activate the gastrocs for stronger, more effective training, knee positioning is key. To place the gastrocs into a fully stretched position, the knee must remain straight—no bending allowed!—while the ankle is dorsiflexed (meaning heels down, toes up). Watch the video, and you'll see this is harder than it seems! Plenty of strong lifters think they're keeping the knees locked, but they're definitely not. As the calf raise is initiated, the ankle must move into a full plantar flexed position (toes down, heels up) to peak the contraction of the lower legs and flex with the best quality possible. While the ankle is moving through a full range of motion, the knee remains extended. Again, a simple detail, but extremely important for success. But stick with it, and it'll definitely pay off. The more you can control this movement under load, the more this new range of motion or movement pattern can be better hard-wired into your body's movement library. With time, this will do more for your ankle mobility than foam rolling, stretching, and "mobilizing" the ankles before every single leg day. Earn it with the burn, then watch it pay off in the squat rack—and maybe, just maybe, in an extra inch or two in the calves.